For more than 25 years now we have been predicting a grim, overheated future of droughts, heat waves, rising sea levels and flash floods as global warming plunges the earth in to climate chaos. Mankind’s profligacy with fossil fuels has led to billions of tons of carbon dioxide bring pumped into the atmosphere, creating a warming blanket around the earth – in turn triggering a global fever from which many scientists believe we will take millennia to recover. But along this week come extraordinary claims that cosmic forces beyond our control may be about to plunge the Earth in to a mini-ice age or at the very least they will ameliorate the perilous effects of manmade global warming. Rising to the rescue is the Sun, our life-giving star and the agency which, many global warming sceptics insist, is the real cause of the temperature rises we have seen in the last century or so. The idea that the Sun could now be about to cause global COOLING seems bizarre, but it is not as outlandish as it seems. For there is some evidence that this has happened before – most notably three centuries ago when changes in the Sun appeared to be linked to a period of almost unprecedented cold. So could this be about to happen again? And what does this mean for the great climate change thesis? At an American Astronomical Association conference this week in New Mexico, three groups of scientists who study the Sun reported on a missing jet stream, fading spots, and slower activity near the poles and say that our Sun is heading for a period of ‘hibernation’ - a period of solar quiescence in which sun spots (relatively dark patches on its surface which can be seen from Earth) disappear and the solar wind – the stream of electrically charged gases spewed in to space by our star – dwindles to nothing. All this is surprising because most Solar experts have been predicting such a ‘manic’ phase in the next few years, so much so that some have warned the Earth is at risk from powerful Solar storms which could wreck electrical grids and satellite communications. If the Sun really is entering a period of hibernation then this could, in theory, put a dampener on global warming. The link between Solar ‘moods’ and the weather down here on Earth was first noticed in the 1970s, when the American astronomer Jack Eddy noticed a strong correlation between historic weather records and contemporaneous accounts of Solar activity, most notably the long record of sunspots published a century before by the astronomer Edward Maunder. Eddy noticed that a ‘quiet’ Sun correlates with cold weather and a ‘manic’ phase means warmer conditions. His best evidence for this link comes from the last time the Sun went to sleep, the so-called ‘Maunder Minimum’ period from 1645 to 1715. During this period and for about a century either side, much of Europe and North America suffered a succession of bitterly cold winters and damp washout summers - the ‘little ice age’. At this time the River Thames in London regularly froze over, and jolly frost fairs were held on the ice, which at times was more than a foot deep. People paid a penny to be dragged along the frozen river on sledges and immense barbecues were set up to roast hogs and oxen to provide sustenance for the teeming crowds. People could walk from Poland to Sweden across a frozen Baltic Sea and the English Channel froze around the ports of the South Coast. During the winter of 1683-84 daytime temperatures in parts of Britain probably dropped below -10C for days on end. Jolly frost fairs aside, the cold and wet caused crops to fail all over Europe triggering famines and malnutrition. Indeed, the lingering cold of the little ice age would stretch well in to the nineteenth century may have sparked a series of revolts by the impoverished and often hungry peasantry in Europe – including the French Revolution. 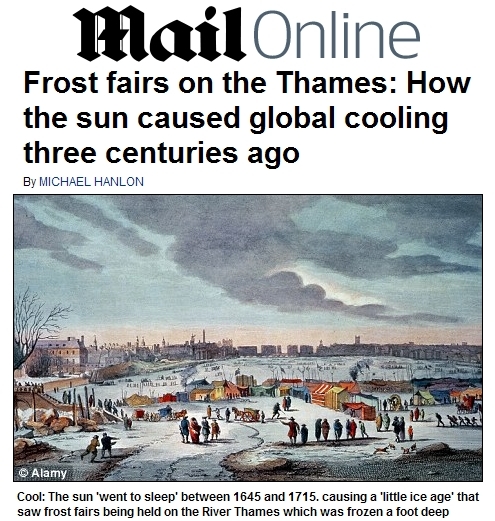 Many climate change sceptics maintain that if the Earth is getting warmer, this is simply because it is still ‘recovering’ from the effects of the Little Ice Age, as the Sun returns to normal. Indeed, in the 1990s a pair of Danish physicists, Eigil Friis-Christensen and Hans Svensmark posited a complex hypothesis linking Solar activity, sunspots, cosmic rays, cloud formation on Earth and global temperature changes. Their theory, which explains how a ‘quiet’ Sun can cause global cooling (and a manic one the opposite) is very controversial, but now there is acceptance that changes in the Sun may account, at least in part, for some of the climate change we see on Earth. On a simple level, the complex Danish hypothesis aside, when the Sun is very active it is very slightly hotter than when it is not. It is important to realise that no one is saying the Earth is about to be plunged in to an actual full-blown ice age and even a mini ice-age of the sort which we saw in the Middle Ages is probably unlikely. And although a sudden reduction in solar activity may ameliorate climate change to an extent it certainly will not cancel it out altogether. Professor Joanna Haigh professor of atmospheric physics at Imperial College in London said this week that it would be ‘very risky’ to rely on changes in the Sun to save us from global warming. She and other scientists point out that even if solar cooling causes a one degree fall in temperatures, human induced climate change is predicted to cause rises of between two and four degrees over the next hundred years. Other scientists point out that even during the Maunder Minimum temperatures were not universally cold, certainly not worldwide and not even in Europe. The coldest winter in Britain since any kind of reliable records began was in 1683 at the height of the little ice age. However, the winter of 1685 was the sixth warmest on record. It is also likely that during the little ice age temperatures in the Arctic were even higher than today. The basic physics of what happens when you pump 30 billion tons of CO2 in to the atmosphere every year, as we are doing, is quite well understood. Now most scientists are agreed that pretty well all that matters when it comes to climate change is how humans decide to generate electricity over the next century. In the end it is China’s sensible decision to build dozens of nuclear power stations, and Germany’s perverse decision to cancel its nuclear program that will probably have far more effect on our climate in the years to come than mysterious changes in the Sun that are wholly beyond our control.